Ouyang Riping was born in Longhui county of Hunan province in February 1954. Ouyang graduated from Changsha Railway University with a French major and as a Chinese Communist Party member, and began working at the China Academy of Railway Sciences as a translator in 1977. He later worked abroad. In 1991, as president and general manager, he established the Ivory Coast Trading Enterprise, which was expanded and renamed Datong Trading Enterprises Co Ltd the following year. 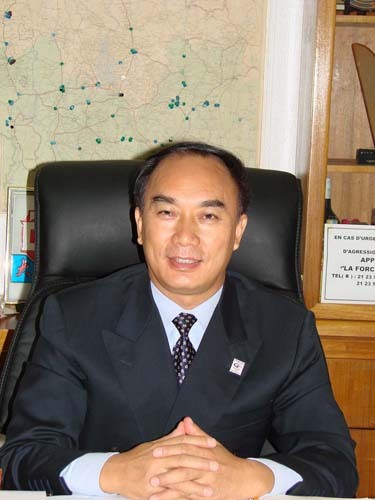 Ouyang is also the president of the Cote d'Ivoire Federation of Overseas Chinese and the Council for the Promotion of China’s Peaceful Reunification in Cote d'Ivoire; honorary president of the Cote d'Ivoire- China Friendship Association and Mali Federation of Overseas Chinese; and vice president of the Chinese Chamber of Commerce in Mali. Datong Trading is now a diversified group with business in West African countries and has made enormous contributions to Africa’s underdeveloped agricultural industry. The company’s agricultural machines have been sold to nine African countries - Cote d'Ivoire, Ghana, Mali, Burkina Faso, Niger, Guinea, Mauritania, Senegal and Angola. With four subsidiaries, the group extended its business by adding an international shipping department to handle customs and shipping for Chinese companies stationed in Mali and Cote d'Ivoire, an agricultural machine sales department and an assembly plant, as well as a joint-stock oil-pressing factory. It is the only company in West Africa that can compete with European and American rivals. Apart from the company, Ouyang also is dedicated to the two overseas Chinese federations, and spends more than $20,000 every year in activity funds for the groups. He launched Kehuazhisheng magazine (Voice of Overseas Chinese in Cote d'Ivoire) in 2005, the first Chinese magazine in Cote d'Ivoire, which is issued in more than 100 countries and regions for free, boosting the connection between the two overseas Chinese federations and other overseas Chinese organizations. At the time of the snow disaster and Wenchuan Earthquake in 2008, Ouyang made immediate donations to help his Chinese compatriots restore their homes. And he never forgets his hometown - he has contributed more than 500,000 yuan ($80,050) for public welfare and supported four students to finish college. His involvement in public affairs has won him praise and trust from Chinese organizations, which in turn has boosted his company.